Sock hop party planning can be just as fun as the actual event when you get together with some good friends and great ideas. For a successful sock hop, your mindset has to be completely 1950s. Get together with a group of friends and brainstorm all of your ideas; write them all down and circle your must-have party items. Be sure to cover everything from invitations to parting gifts, as you'll want to have a complete plan before going shopping for supplies. Not being properly prepared can bring unnecessary expenses to your party planning, as you'll be rushed and less organized. If you aren't old enough to remember the 1950s yourself, try to talk to a friend or family member who can recall things from that era. This will bring an authentic, accurate feel to your party. The invitations you send out will set the stage for the rest of your sock hop party planning, so be sure to do something creative. Make miniature 45 records out of cardstock and tempera paint, and write the name of the party hosts as the "title" of the record track. You can also make miniature jukeboxes, milkshakes or leather jackets, or use free dance graphics to set the tone for the party. Use your imagination and go with the best novelty idea you can come up with. If you aren't artistically inclined, many party stores carry 1950s themed invitations you can use for your sock hop, and you can also order them through websites such as Party Supplies Hut. Party decorations are another important element to your sock hop planning, as it sets the stage for the entire gathering. Printing out photographs of popular celebrities of the era can help bring a vintage feel to your party, and you can also find classic malt-shop style signs through vintage sales on eBay and other online marketplaces. Look for old records at garage sales that you can hang from the ceiling or in doorways, and pick a 1950s color scheme such as cherry red, pink or avocado for your main gathering room. Music notes, silhouettes of dancers in poodle skirts, and Cadillacs can all make great backdrops and wall décor. No party is complete without refreshments, so jot down plenty of good ideas when planning your sock hop. 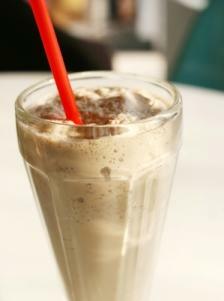 Classic Coca-Cola is a must-have, as is a root beer float and milkshake counter. You can also make miniature hamburgers and French fries, with slices of apple pie for dessert. Cupcakes themed after mainstream films and music of the decade are a huge hit, and piping song lyrics directly onto the frosting or printing out miniature photographs from movies can make the cupcakes blend in with the rest of your party theme. Invite guests to get into the sock hop spirit by requesting that they come in costume. Women can wear poodle skirts, pink jackets, vintage sunglasses and saddle shoes. Men can arrive in jeans, white t-shirts, black leather jackets and slicked back hair. Doubling up as an activity, you can hold a costume contest. Have prizes for different categories such as most authentic and most outrageous outfits. Prizes should be items you could buy in the 1950s, and can be anything from childhood toys to a special food item. Do your prize shopping well ahead of time so you will have the chance to special order things you couldn't find in shops. If your sock hop is for children or young adults, games might be a fun way to pass the time. Consider hosting a hula-hoop or karaoke contest. You can also have a makeover party for little girls, creating 1950s hairstyles and painting everyone's nails pink or mint green. Thank your guests for coming with a sweet and simple party favor. Go to a specialty candy shop and pick up packages of Bazooka bubble gum, or give out fuzzy dice to everyone in attendance. If you have the time, you can make a CD compilation of 1950s tunes as your parting gift. Sock hop planning is fun and is sure to make your event a memorable one for all involved.